It is essential for brands to reinforce their message throughout the academic year and a students University life so that their relationship with the brand goes beyond their studies. Brands often see fantastic results from Freshers Fair activities, but fail to keep students engaged after this event. A year round presence is key for any brand and onsite experiential is a great opportunity for brands to achieve this. Often less crowded than Freshers Fairs onsite experiential activities at alternative times throughout the year can strengthen the bond between student and brand. 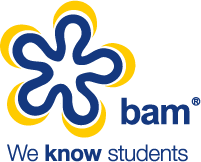 With over 200 University campuses, key student venues and student events across the UK and ROI, BAM can get you access to students directly at source. With footfalls in excess of 5,000 and with access to campuses and student events throughout the year, onsite experiential campaigns provide a direct route to students, keeping the brand message alive.